American art of the 1980s is as misunderstood as it is notorious. Critics of the time feared that market hype and self-promotion threatened the integrity of art. They lashed out at contemporary art, questioning the validity of particular media and methods and dividing the art into opposing camps. While controversies have since subsided, critics still view art of the 1980s as a stylistic battlefield. Alison Pearlman rejects this picture, which is truer of the period’s criticism than of its art. Pearlman reassesses the works and careers of six artists who became critics’ biggest targets. In each of three chapters, she pairs two artists the critics viewed as emblematic of a given trend: Julian Schnabel and David Salle in association with Neo-Expressionism; Jean-Michel Basquiat and Keith Haring vis-à-vis Graffiti Art; and Peter Halley and Jeff Koons in relation to Simulationism. Pearlman shows how all these artists shared important but unrecognized influences and approaches: a crucial and overwhelming inheritance of 1960s and 1970s Conceptualism, a Warholian understanding of public identity, and a deliberate and nuanced use of past styles and media. Through in-depth discussions of works, from Haring’s body-paintings of Grace Jones to Schnabel’s movie Basquiat, Pearlman demonstrates how these artists’ interests exemplified a broader, generational shift unrecognized by critics. She sees this shift as starting not in the 1980s but in the mid-1970s, when key developments in artistic style, art-world structures, and consumer culture converged to radically alter the course of American art. Unpackaging Art of the 1980s offers an innovative approach to one of the most significant yet least understood episodes in twentieth-century art. 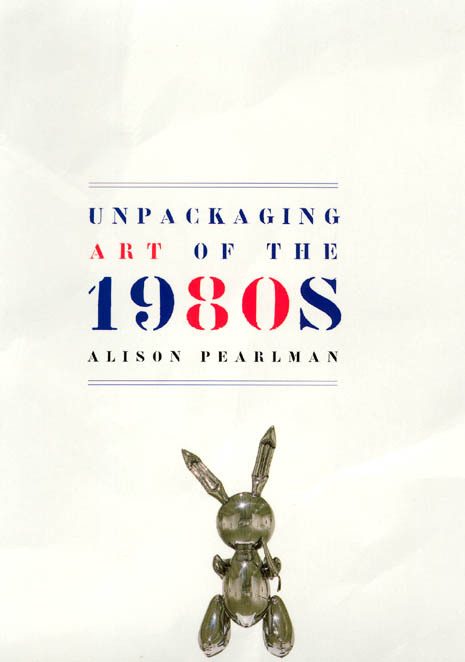 "Alison Pearlman’s account of New York art in the 1980s is a greatly overdue corrective to the dominant paradigms of critical postmodernism, releasing the debate on this pivotal era from a ’state of suspended cartoon animation’... Pearlman’s book is crucial reading for anyone interested in American art and compulsory for anyone who has failed to comprehend the seismic shift in art’s culture that has triumphed in the past 25 years."